HOUSTON – (July 14, 2010) – Rice University scientists have found the “ultimate” solvent for all kinds of carbon nanotubes (CNTs), a breakthrough that brings the creation of a highly conductive quantum nanowire ever closer. Nanotubes have the frustrating habit of bundling, making them less useful than when they’re separated in a solution. Rice scientists led by Matteo Pasquali, a professor in chemical and biomolecular engineering and in chemistry, have been trying to untangle them for years as they look for scalable methods to make exceptionally strong, ultralight, highly conductive materials that could revolutionize power distribution, such as the armchair quantum wire. The armchair quantum wire — a macroscopic cable of well-aligned metallic nanotubes — was envisioned by the late Richard Smalley, a Rice chemist who shared the Nobel Prize for his part in discovering the the family of molecules that includes the carbon nanotube. Rice is celebrating the 25th anniversary of that discovery this year. Pasquali, primary author Nicholas Parra-Vasquez and their colleagues reported this month in the online journal ACS Nano that chlorosulfonic acid can dissolve half-millimeter-long nanotubes in solution, a critical step in spinning fibers from ultralong nanotubes. Current methods to dissolve carbon nanotubes, which include surrounding the tubes with soap-like surfactants, doping them with alkali metals or attaching small chemical groups to the sidewalls, disperse nanotubes at relatively low concentrations. These techniques are not ideal for fiber spinning because they damage the properties of the nanotubes, either by attaching small molecules to their surfaces or by shortening them. A few years ago, the Rice researchers discovered that chlorosulfonic acid, a “superacid,” adds positive charges to the surface of the nanotubes without damaging them. This causes the nanotubes to spontaneously separate from each other in their natural bundled form. This method is ideal for making nanotube solutions for fiber spinning because it produces fluid dopes that closely resemble those used in industrial spinning of high-performance fibers. Until recently, the researchers thought this dissolution method would be effective only for short single-walled nanotubes. In the new paper, the Rice team reported that the acid dissolution method also works with any type of carbon nanotube, irrespective of length and type, as long as the nanotubes are relatively free of defects. “Just adding the nanotubes to chlorosulfonic acid results in dissolution, without even mixing,” he said. They also observed for the first time that long SWNTs dispersed by superacid form liquid crystals. “We already knew that with shorter nanotubes, the liquid-crystalline phase is very different from traditional liquid crystals, so liquid crystals formed from ultralong nanotubes should be interesting to study,” he said. Parra-Vasquez, now a postdoctoral researcher at Centre de Physique Moleculaire Optique et Hertzienne, Universite’ de Bordeaux, Talence, France, came to Rice in 2002 for graduate studies with Pasquali and Smalley. Study co-author Micah Green, assistant professor of chemical engineering at Texas Tech and a former postdoctoral fellow in Pasquali’s research group, said working with long nanotubes is key to attaining exceptional properties in fibers because both the mechanical and electrical properties depend on the length of the constituent nanotubes. Pasquali said that using long nanotubes in the fibers should improve their properties on the order of one to two magnitudes, and that similar enhanced properties are also expected in thin films of carbon nanotubes being investigated for flexible electronics applications. Co-authors of the paper are graduate students Natnael Behabtu, Colin Young, Anubha Goyal and Cary Pint; Pulickel Ajayan, the Benjamin M. and Mary Greenwood Anderson Professor in Mechanical Engineering and Materials Science and of chemistry, and Robert Hauge, a distinguished faculty fellow in chemistry, all at Rice; and Judith Schmidt, Ellina Kesselman, Yachin Cohen and Yeshayahu Talmon of the Department of Chemical Engineering, Technion-Israel Institute of Technology, Haifa, Israel. The Air Force Office of Scientific Research, the Air Force Research Laboratory, the National Science Foundation Division of Materials Research, the Robert A. Welch Foundation, the United States-Israel Binational Science Foundation and the Evans-Attwell Welch Postdoctoral Fellowship funded the research. I can blog all day about nanotechnology breakthroughs and we can get excited about the theoretical improvements nanotech promises, but the proof in the pudding is getting nanotech to the market. Particularly some of the more dramatic applications. Improving existing items through nanotech is great, but I want the game-changers to get out there in the real world. It look like electronic application for nanotube devices are getting close to that point. Couldn’t happen too fast for me. Circuits made from carbon nanotubes are intrinsically faster than those made from silicon. But while products from tennis rackets to bike frames take advantage of nanotubes’ light weight and strength, no commercial devices have yet exploited their remarkable electrical properties. That’s partly because researchers have had difficulty creating films or other assemblies of nanotubes that preserve those properties: nanotube arrays, for example, proved nowhere near as electrically conductive as tubes taken singly. But a number of groups have found ways around that ­obstacle, and the result has been a flurry of prototype electronic devices that use nanotubes. Here is a sampling. Very cool nanotech story and image from PhysOrg. An electron microscope image of the smallest reported square-cross-section nanotube. Image courtesy Daniel Ugarte. Scientists have observed the smallest reported nanotube that has a square cross-section. The structure formed spontaneously and unexpectedly when silver nanowires were stretched and is a reminder that scientists still have much more to learn about the nanoscale world. The study was performed by scientists at two Brazilian institutions, the Laboratorio Nacional de Luz Sıncrotron (the Brazilian Synchrotron Light Laboratory) and the Universidade Estadual de Campinas-UNICAMP. This research illustrates how material behavior at the nanoscale can be vastly and surprisingly different from the macroscopic scale, particularly in the case of applied mechanical stress. In general, the main differences between the behaviors of nanoscale and bulk materials are due to “surface energy.” In the physics of solid materials, surfaces must be less energetic than the rest of the material, lest surfaces be constantly created until the material become nothing but a single surface. For nanostructures, surface energy is more powerful because there is such a small amount of the material. Scientists expect to see certain atomic behaviors, such as how the atoms order themselves, based on predictions of surface energy. But this work has shown that the addition of a mechanical stress, such as pulling, can produced unexpected results. VIDEO: 5-nm size gold nanoparticles wrap around the perimeter of a DNA nanotube in a spiral pattern. The 3-D structures have been recreated from cryoelectron tomographic imaging. Arizona State University researchers Hao Yan and Yan Liu imagine and assemble intricate structures on a scale almost unfathomably small. Their medium is the double-helical DNA molecule, a versatile building material offering near limitless construction potential. In the January 2, 2009 issue of Science, Yan and Liu, researchers at ASU’s Biodesign Institute and faculty in the Department of Chemistry and Biochemistry, reveal for the first time the three-dimensional character of DNA nanotubules, rings and spirals, each a few hundred thousandths the diameter of a human hair. These DNA nanotubes and other synthetic nanostructures may soon find their way into a new generation of ultra-tiny electronic and biomedical innovations. Yan and Liu are working in the rapidly proliferating field of structural DNA nanotechnology. By copying a page from nature’s guidebook, they capitalize on the DNA molecule’s remarkable properties of self-assembly. When ribbonlike strands of the molecule are brought together, they fasten to each other like strips of Velcro, according to simple rules governing the pairing of their four chemical bases, (labeled A, C, T and G). From this meager alphabet, nature has wrung a mind-bending multiplicity of forms. DNA accomplishes this through the cellular synthesis of structural proteins, coded for by specific sequences of the bases. Such proteins are fundamental constituents of living matter, forming cell walls, vessels, tissues and organs. But DNA itself can also form stable architectural structures, and may be artificially cajoled into doing so. VIDEO: In this DNA nanotube configuration, again using 5-nm size gold nanoparticles, the nanoparticles form stacked rings around the DNA. In his research, Yan has been much inspired by nanoscale ingenuity in the natural world: “Unicellular creatures like oceanic diatoms,” he points out, “contain self-assembled protein architectures.” These diverse forms of enormous delicacy and organismic practicality are frequently the result of the orchestrated self-assembly of both organic and inorganic material. Scientists in the field of structural DNA nanotechnology, including Dr. Yan’s team, have previously demonstrated that pre-fab DNA elements could be induced to self-assemble, forming useful nanostructural platforms or “tiles.” Such tiles are able to snap together—with jigsaw puzzle-piece specificity—through base pairing, forming larger arrays. Yan and Liu’s work in Science responds to one of the fundamental challenges in nanotechnology and materials science, the construction of molecular-level forms in three dimensions. To do so, the team uses gold nanoparticles, which can be placed on single-stranded DNA, compelling these flexible molecular tile arrays to bend away from the nanoparticles, curling into closed loops or forming spring-like spirals or nested rings, roughly 30 to 180 nanometers in diameter. The gold nanoparticles, which coerce DNA strands to arc back on themselves, produce a force known as “steric hindrance,” whose magnitude depends on the size of particle used. Using this steric hindrance, Yan and Liu have shown for the first time that DNA nanotubules can be specifically directed to curl into closed rings with high yield. When 5 nanometer gold particles were used, a milder steric hindrance directed the DNA tiles to curl up and join complementary neighboring segments, often forming spirals of varying diameter in addition to closed rings. A 10 nanometer gold particle however, exerted greater steric hindrance, directing a more tightly constrained curling which, produced mostly closed tubules. Yan stresses that the particle not only participates in the self-assembly process as the directed material, but also as an active agent, inducing and guiding formation of the nanotube. VIDEO: Using 10-nm-size gold nanoparticles, the DNA nanotubes form a split branch structure, with both the spiral tube splitting into two smaller stacked rings. DNA nanotubules will soon be ready to join their carbon nanotube cousins, providing flexible, resilient and manipulatable structures at the molecular level. Extending control over 3-D architectures will lay the foundation for future applications in photometry, photovoltaics, touch screen and flexible displays, as well as for far-reaching biomedical advancements. Yan and Liu believe that controlled tubular nanostructures bearing nanoparticles may be applied to the design of electrical channels for cell-cell communication or used in the construction of various nanoelectrical devices. Made by researchers at Tsinghua University in Beijing, the carbon nanotube speakers can play music just as loud and just as high quality as conventional loudspeakers do, even while being flexed and stretched. Conventional loudspeakers use magnets and moving parts to produce sound-pressure waves. The nanospeakers work by the thermoacoustic effect. Alternating electrical current running through the thin films of nanotubes heats the surrounding air, causing it to expand and contract, creating sound waves. These transparent thin-film speakers could be mounted on displays, eliminating the need for separate speakers. But one of the coolest things about the loudspeakers is that they’re flexible and stretchable, allowing the researchers to imagine singing jackets. The research was published online in the journal Nano Letters. A greener, less expensive method to produce hydrogen for fuel may eventually be possible with the help of water, solar energy and nanotube diodes that use the entire spectrum of the sun’s energy, according to Penn State researchers. Currently, the steam reforming of natural gas produces most of our hydrogen. As a fuel source, this produces two problems. The process uses natural gas and so does not reduce reliance on fossil fuels; and, because one byproduct is carbon dioxide, the process contributes to the carbon dioxide in the atmosphere, the carbon footprint. Grimes’ process splits water into its two components, hydrogen and oxygen, and collects the products separately using commonly available titanium and copper. Splitting water for hydrogen production is an old and proven method, but in its conventional form, it requires previously generated electricity. Photolysis of water solar splitting of water has also been explored, but is not a commercial method yet. In Grimes’ photoelectrochemical diode, one side is a nanotube array of electron donor material – n-type material – titanium dioxide, and the other is a nanotube array that has holes that accept electrons – p-type material – cuprous oxide titanium dioxide mixture. P and n-type materials are common in the semiconductor industry. Grimes has been making n-type nanotube arrays from titanium by sputtering titanium onto a surface, anodizing the titanium with electricity to form titanium dioxide and then annealing the material to form the nanotubes used in other solar applications. He makes the cuprous oxide titanium dioxide nanotube array in the same way and can alter the proportions of each metal. While titanium dioxide is very absorbing in the ultraviolet portion of the sun’s spectrum, many p-type materials are unstable in sunlight and damaged by ultraviolet light, they photo-corrode. To solve this problem, the researchers made the titanium dioxide side of the diode transparent to visible light by adding iron and exposed this side of the diode to natural sunlight. The titanium dioxide nanotubes soak up the ultraviolet between 300 and 400 nanometers. The light then passes to the copper titanium side of the diode where visible light from 400 to 885 nanometers is used, covering the light spectrum. The photoelectrochemical diodes function the same way that green leaves do, only not quite as well. They convert the energy from the sun into electrical energy that then breaks up water molecules. The titanium dioxide side of the diode produces oxygen and the copper titanium side produces hydrogen. Although 0.30 percent efficiency is low, Grimes notes that this is just a first go and that the device can be readily optimized. Grimes is now working with an electroplating method of manufacturing the nanotubes, which will be faster and easier. Working with Grimes are Gopal K. Mor, Oomman K. Varghese and Karthik Shankar, research associates; Rudeger H. T. Wilke and Sanjeev Sharma, Ph.D. candidates; Thomas J. Latempa, graduate student, all at Penn State; and Kyoung-Shin Choi, associate professor of chemistry, Purdue University. The U.S. Department of Energy supported this research. In a departure from the usual format, here’s a roundup of nanotech news from the last two days of KurzweilAI.net’s e-newsletter. There’s so much here these bits are taken straight from the email. From KurzweilAI.net — amazing advances in chip-cooling tech removes 1K watts per square centimeter and nanotube-laden integrated circuits become economical. Purdue University researchers have developed a technology that uses “microjets” to deposit liquid into tiny channels and remove five times more heat (1,000 watts per square centimeter) than other experimental high-performance chip-cooling methods for computers and electronics. Stanford electrical engineers have developed a method for making integrated circuit chips with the needed variety of logic gates on the scale and with the parallelism that the semiconductor industry must employ to make chips that are economical. The Stanford-devised process involves growing nanotubes on a quartz wafer and then transferring them onto a silicon wafer patterned with metal electrodes. The nanotubes could then connect the electrodes to make transistors and logic gates. Different format today for the KurzweilAI.net newsletter highlights. There is so much good stuff I’m dropping bits directly from the newsletter. Today features solar, stretchy silicon, quantum computing news, self assembly, electricity producing nanotubes, and a possible successor to silicon — graphene. … from the KurzweilAI.net newsletter. KurzweilAI.net, Feb. 27, 2008MemeBox has announced the public beta release of Future Blogger, a blogging community dedicated to exploring the future.Visitors can post their thoughts, predictions and scenarios. Community ratings then determine page ranking for posts. The site’s Future Scanner also aggregates and organizes information about the future by year and category. 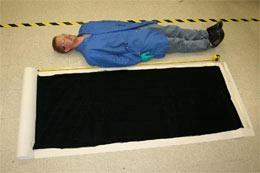 Nature News, Feb. 27, 2008Nanocomp Technologies has built a 3 foot by 6 foot sheet of woven and layered carbon nanotubes with a breaking strength stronger than stainless steel. The sheets are also lightweight, with a density of 0.2-0.3 grams per cubic centimeter (30 times less dense than steel). The final material is paper-like and can be folded, stretched and cut with scissors. The millimeters-long nanotubes are woven into 30nm diameter bundles, which in turn are layered on a rotating drum, where electrostatic forces hold the bundles together.